The Miss America Organization revealed today the panel of distinguished judges for the 2014 Miss America Preliminary Competition. 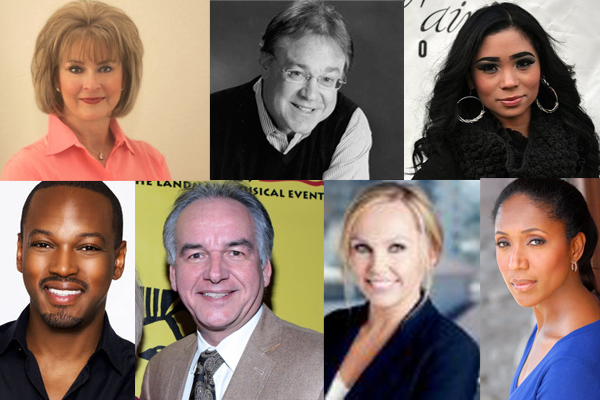 The diverse group of seven judges features a Miss America; an acclaimed music critic at The Boston Globe; former Executive Vice President of Time, Inc., a celebrity hair stylist, the musical director and conductor of the Tony Award-winning Broadway musical The Lion King, the Vice President of the William Morris Endeavor Talent Agency, and a former Miss Louisiana. The preliminary judges will gain the first insight into this year’s 53 contestants, joining together to evaluate them for three nights on Tuesday, September 10, Wednesday, September 11, and Thursday, September 12. Bringing expertise from their individual fields, the panel will assess each contestant’s performance in categories including Lifestyle and Fitness in Swimsuit, Evening Wear, Talent, Interview, and an On-Stage question. A separate celebrity panel will judge the final competition on September 15, during a live broadcast on ABC from Boardwalk Hall in Atlantic City. Shirley Cothran Barret: This Miss America crowned in 1975 has motivated audiences with her transparent and humorous candor for more than 30 years. After receiving a doctorate degree in education, Barret became an author and professional speaker who serves on boards such as MADD, Texas Speedway Children’s Charity, and her local school board. Using her life experiences, she motivates, encourages and edifies her listeners to examine their present and future destinies. Richard Dyer: This notable journalist spent 25 years as a critic with The Boston Globe and is a two-time winner of the Deems Taylor/ASCAP Award. He is currently writing a book celebrating the 50 years of the Van Cliburn International Piano Competition, of which he has been a member of the jury since 2001. Dyer is a former Briggs-Copeland lecturer at Harvard University and has also written for many music publications, including Opera News, High Fidelity, Musical American and The Nation. Oscar James: This Emmy Award-winning celebrity hair stylist maintains a loyal client list of supermodels and entertainers all over the world. He has styled celebrities such as Tyra Banks, Halle Berry, Former Miss America 1984 Vanessa Williams, and Beyoncé. His work can be seen on the pages of Vogue, Glamour, Essence, In Style and Cosmopolitan. Karl Jurman: Jurman is the musical director and conductor of the Tony Award-winning Broadway musical The Lion King, currently celebrating its 15th year on Broadway. Jurman served as Music Supervisor International (London & Australian companies) of Disney’s Beauty and the Beast, as well as Conductor on Broadway. Previous Broadway conducting assignments include Guys and Dolls, The Will Rodgers Follies and Into the Woods. Karl has played piano for over 20 Broadway and Off-Broadway musicals. He is married to former Miss New Jersey and 2nd runner-up to Miss America Mary D’Arcy. Cori Wellins: Wellins is a WME partner and television literary agent. She represents a broad array of producers, writers, show runners, and talent in both the scripted and non-scripted space. Wellins’ clients include Rob Bowman (Castle), Christina Boylan (Once Upon a Time), Steve Holland (The Big Bang Theory), Liz Meriwether (New Girl), former National Lampoon writer Steve Hely (The Office), Matt Warburton (The Mindy Project), Alan Yang (Parks & Recreation), The View co-host Jenny McCarthy, and many others. Wellins began her entertainment career as an actress, appearing in films including Arachnophobia. In 1995, she joined the William Morris Agency and currently heads the agency’s television literary department. Nita Whitaker: This former Miss Louisiana and Hall of Fame Star Search Grand Champion Winner is an accomplished singer in clubs and arenas, as well as television and movies. She has been the guest performer at The Freedom Awards honoring Oprah Winfrey, President Bill Clinton and actress Ruby Dee, sang duets with Andrea Bocelli during a Winter Tour, and has performed with Josh Groban, Michael Buble and Chris Botti. She has also shared the stage with Barbra Streisand, Faith Hill, Celine Dion, Richard Marx, Stevie Wonder and Yolanda Adams. Whitaker has penned a book titled Finding My Voice: My Journey through Grief to Grace.